Artist Aaron Fowler creates elaborate assemblage paintings from discarded found objects and unconventional materials sourced from his local surroundings. 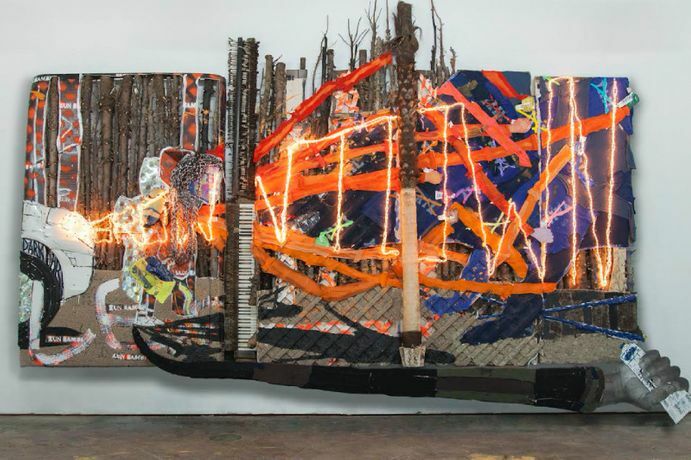 For the window of the New Museum’s 231 Bowery Building, Fowler presents “Bigger Than Me,” a new installation of his work. On a back­ground of tiled mirror are two works: Lex Brown Town (2017) in the left window, and Miss Logan (2017-18) in the right. Like many of Fowler’s projects, both of these pieces are reflections on specific individuals who have been sources of inspiration for the artist. Lex Brown Town is an homage to Fowler’s fellow artist, collaborator, and MFAclassmate at Yale School of Art, Lex Brown. Deploying materials including shirt­sleeves, hair weave, and a Minions backpack, Fowler portrays Brown in orange, fighting off a wolf. This piece was inspired in part by a perfor­mance she staged at Yale, Run Bambi (2016), in which Brown describes finding her way through obstacles including racism and sexism. This composition sits atop nine monitors screening video footage of Fowler collecting Christmas trees as material for his work.